The work done by Brock Windows and Doors was exceptional. All communications done prior to the installation were clear and precise. On installation day, the crew set up and ensured that the work area was prepared with a drop cloth. The work area was cleaned during and after the installation. We are very happy with our new patio door and would highly recommend Brock Windows and Doors to any future customers considering replacing their patio door. The integrated blinds are fantastic and we are definitely enjoying the upgrade. Thank you for your lovely feedback regarding your recent patio door replacement project. We appreciate you entrusting our company with the replacement, and are happy to hear that everything went exceptionally. We're glad you're loving the built-in mini blinds! We have called Danny before and would highly recommend his work. He pays attention to detail and gets the job done right. 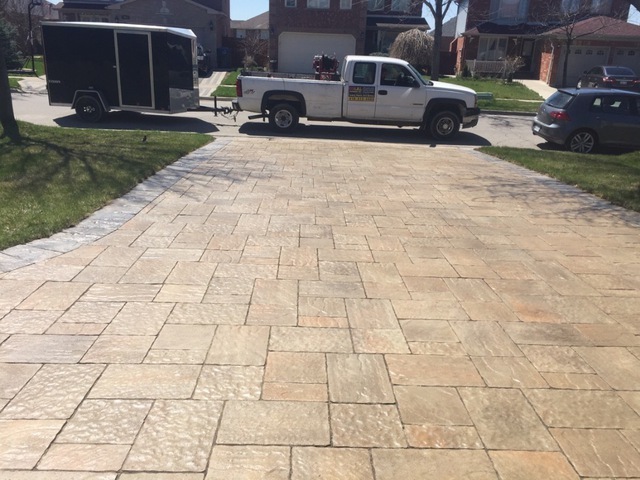 Our stone backyard and driveway look like new again. Thank you, Danny! We were very pleased with the work done. Our driveway and backyard look like new again. We were also pleased with the way Danny negotiated the job with us. He was honest and we as consumers truly appreciated that. Thanks Danny for a great job and we'll be calling you again for another restoration in the future. Backyard Getaways has been a pleasure to deal with from the beginning. The crew always made a good effort to communicate with us about scheduling and about the details of our projects. We are currently enjoying the work in our yard even through the winter season. We had a few issues with our lighting system (bulbs burned out) but John was quick to send someone out so that we could enjoy our lights projected onto the winter snow. I would not hesitate to recommend this company. We will be hiring them come the spring to seal our new driveway and backyard project. Hi Sandra. Thanks very much for your review and for your business. Everyone here at Backyard Getaways enjoyed working with you and Stephen from design through to construction. We hope you and your family enjoy your beautiful backyard oasis for many years to come. We look forward to working with you again very soon. As always, feel free to contact me personally anytime if you need anything. John. I would recommend JSN Appliances Repair. Sam was able to diagnose the problem with my washing machine in no time. He was very honest in telling me that it would be wise to think about whether it would we worth it to fix the bearing in my machine or to get a new one. I appreciated that advice very much. I will definitely use his company in the future for any of my appliances and home heating and cooling needs. I only had to pay for a service call which was perfectly fine.